Nabi Sallallahu Alaihi Wasallam was the most beloved of Allah’s creation. The Sahabah loved him intensely and were ready to give their lives for him. Praise from his blessed lips was for them a coveted asset – a priceless commodity that was a key to perpetual goodness. It was something that every Sahabi longed for. Similarly, the dua of Nabi Sallallahu Alaihi Wasallam in favour of any Sahabi was a sign of the pleasure and approval of Nabi Sallallahu Alaihi Wasallam. As he was the beloved of Allah, there was no doubt about its acceptance. Fortunate were those Sahabah who received the praises and duas of Nabi Sallallahu Alaihi Wasallam. 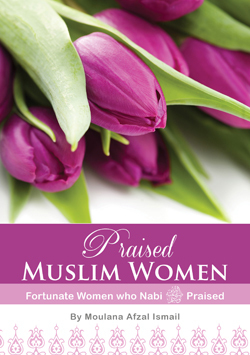 In this short book, an attempt has been made to gather those narrations in which Nabi Sallallahu Alaihi Wasallam praised or made dua for a Sahabiya (female companion of Nabi Sallallahu Alaihi Wasallam).